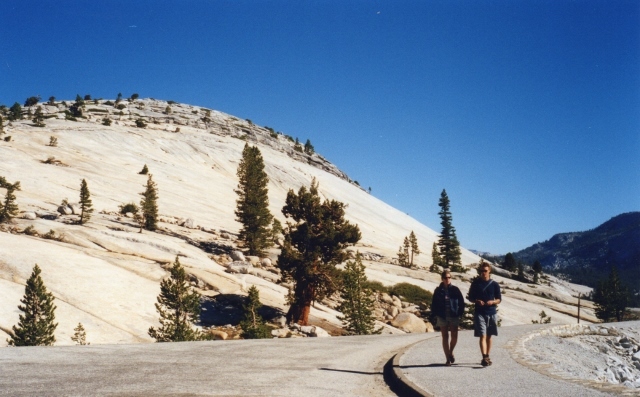 We leave Yosemite over a high pass in the surrounding mountains and stop near a tarn to bid farewell to Half-Dome. Descending swiftly, we see remnants of glaciers and stop at Bodie, a ghost town which has been left as found, in the desert, when deserted by gold-seekers long ago. A strange, still place. We explore Mono Lake shore – some birds, many salt pillars, very hot – before camping late at Lone Pine, a lovely site beside another lake. 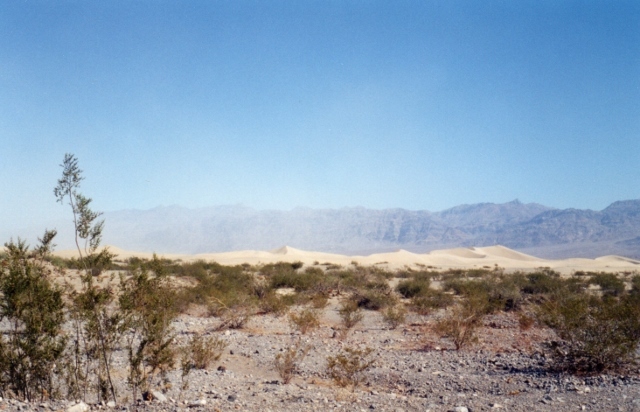 We break camp after an early rise to get through Death Valley before it becomes too hot. A long hot day – endless straight roads. Low scrub, salt pans, Joshua trees, high mountain ranges in varicoloured hues; lava folds and cracks, like parts of the Rift Valley, but more bleak and lifeless. Endless salt flats like those found at LakeMagadi, but on a bigger scale. Heat 100 degrees in the shade (the record is 134 degrees). Thank goodness for the air-conditioned bus. We drive below sea level. An extraordinary place. Suddenly, Las Vegas is upon us. We book in at Days Inn and all make a beeline for showers, and then the laundry. 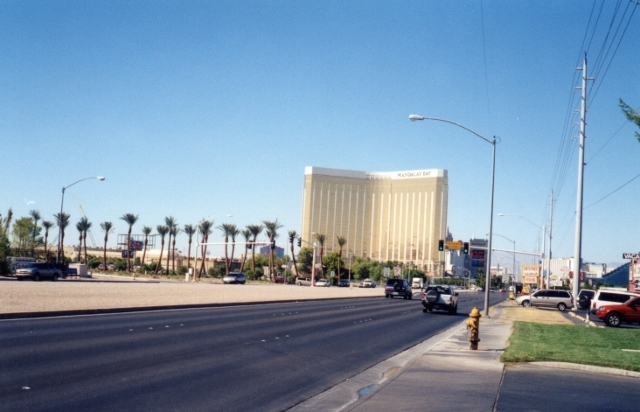 Las Vegas – what a place! Refreshed, we meet outside our hotel and Jane marches us the length of the “strip” (including one monorail break) to the Luxor Hotel. On the way, she calls for volunteers to try out a $12 seven-minute water massage in “NewYorkNew York”. Nobody comes forward, it looks so inviting…. Lovely! Those aching muscles from the hips down have a good going-over. Somebody takes a photograph of me, but I’ve lost it. Everything is overwhelming, and I haven’t mastered the flash on my little (non-digital) camera, so you will have to get an idea of what it is like HERE on the internet! The Statue of Liberty holds down her swirling skirts with one hand while brandishing her torch in the other in ridiculous pose above the gaming tables and rows and rows of slot machines. I leave the group eating all they can for $15 in the Luxor and explore this Egyptian look-alike, then wander on to Mandalay and back again through endless lines of slot machines and croupiers by their tables. The thousands of gambling machines and tables are the only common denominator in these Vegas hotels, each one aping a place or city in typical exaggerated American fashion. Astonishing -and no expense spared. I speed through MGM with half the group, the ceilings spangled with stars; and on to Paris, picturesque with blue skies, pavement cafes and a live band with singer in a corner. We queue for the Eiffel tower and the others laugh, for they have all been to the real Paris, but I enjoy the experience, especially when we break through the fake afternoon clouds into the night outside with an amazing view of this flashy city. Lights of all colours winking and blinking; Central Avenue is alive with car lights, yellow on the left (headlights) and red on the right (tail lights) all the way up The Strip. Down again, and everywhere the clink and chatter of the gaming machines, the occasional roar of victory at roulette, crap or vingt et un; the hum of people, the thump of music. Sporting events flashing on a myriad screens while punters lay their bets. I take a quick look, and learn that Venus has beaten Serena in the US Open Womens’ final, and Leyton Hewitt has got through to meet Pete Sampras in the Mens’ final. Great outdoor videos, people everywhere wearing anything. We squeeze past at least half a dozen wedding parties, brides young and old, beaming in pure white gowns of all descriptions. Venice has even bluer skies than Paris, complete with moving clouds as you stride along the pavements. A moving staircase slopes us up and over a bridge, with canal beneath, and gondolas tied to jetties. We are too late in the evening to see them at work, but admire the Michael Angelo look-alike ceilings. The Fountains of Bellagios perform in beautiful cascades timed to romantic orchestration amid the razmatazz. Jane does us proud, indefatigably hustling us whither we suggest, and our remaining little band of six finally make it back to the hotel at 1 a.m. My feet ache so, and my lips are parched in the dry desert air. Never again will I wince at brash tackiness. You somehow come to accept it in Vegas, allow yourself to be carried along with the flow, take it as a matter of course, and eventually let the sensations grow on you until you just become part of it all. 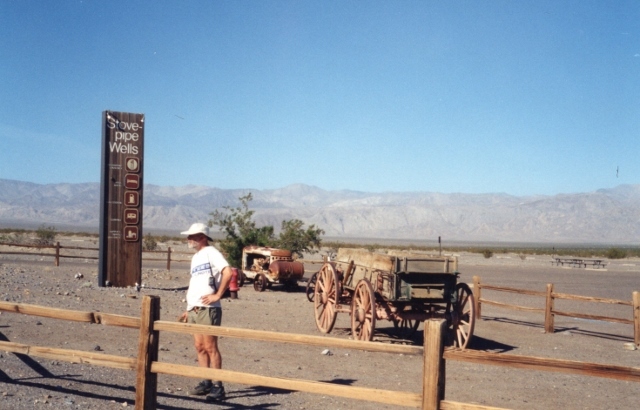 This entry was posted in Travels and tagged Death Valley, Joshua tree, Las Vegas, The Strip, US Open Tennis. Bookmark the permalink.